Even after 50 years of research, progress and success, with thousands of patients helped, few families know about restorative care; many people ignore the healing effects of nutrients. Friends of restorative orthomolecular medicine: patients, families, caregivers and health pros can open closed minds by speaking, writing, sharing and networking. Friends can help Dr. Hoffer and the ISF to educate the public about orthomolecular medicine. Friends can share information, books, references and recovery stories with patients, families, caregivers and health professionals. Friends can advocate for the sick and the suffering; patients deserve quality care: accurate diagnosis followed by safe and effective treatments. Network until closed minds open and restorative care becomes the standard of care. You can share recovery stories, suggest books, network and cooperate. You can help in 15 ways - maybe more. 15 Ways You Can Help to Open Minds! 1. You can tell patients, families, caregivers and health pros about orthomolecular medicine. 2. Show ortho-books, articles & recovery stories at support group meetings and book shows. 3. Speak about orthomolecular history, research, clinical developments, progress and success. 4. Write, talk about and share books and articles about orthomolecular medicine. If you find a new reference book, write a short review that you can hand out and submit for publication. 5. 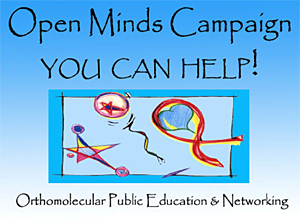 Donate orthomolecular recovery stories to the Open Minds Archives at the ISOM office. Encourage other recovered patients to write about their recoveries and publish to help others. the ISOM book list and tell them about Dr. Hoffer's research, memoirs, books and articles. 7. Attend ISOM conferences - Nutritional Medicine Today - tell others about the meetings. 8. If you belong to mental health support groups such as MDAO - Mood Disorders of ON, share information, books, articles and recovery stories; ask to speak; offer to hand out items. 9. Call the ISOM office if you get the chance to speak at a meeting; ISOM will provide book lists, film flyers, reviews of Dr. Hoffer's scientific memoirs - Adventures in Psychiatry. 10. Start an orthomolecular book club in your area; meet every few months; read from your favourite orthomolecular books. Encourage people to bring their friends and families. 11. Learn the orthomolecular regimens for mood disorders like depression, anxiety, bipolar; thought disorders like schizophrenia and psychosis; attention disorders like ADHD, autism, Aspergers. Share helpful, hopeful information when you network with other people who have these problems or care for family members. Don't expect them to know the facts until you outline the 50+ year history of orthomolecular research, clinical progress and success. 12. Find other volunteers in your area; start Family Support meetings where you can network and discuss how patients can benefit from orthomolecular medicine. 13. Include orthomolecular links in your personal or business web sites. 14. Let people know about the film documentary Masks of Madness: Science of Healing; show the film at support groups, health shows and meetings. Provide handouts. 15. Encourage people to volunteer and donate time and money, energy and effort to the ISOM - ISF and cooperate with their public education and research work. After 15. Open Minds challenge: after you try all 15, you can brainstorm new ways to help. Every time you network, you can help to open minds! Networking is free! It only takes seconds to mention orthomolecular medicine. Minutes to outline possibilities for restorative care. Patients need information, help and hope so they can recover and live well. If you share what you know, you could save a life - today!